Pennsylvanians don't need the Farmers' Almanac to know that we'll likely see snow at some point every winter. It's something PennDOT prepares for all year long. We've got salt piles to stock and snow plows to maintain. A lot goes into making sure our state's roads are safe in the event of winter weather. PennDOT maintains nearly 96,000 snow-lane miles and uses 2,200 trucks, plows, and salt spreaders. You can get full details on our equipment, staffing, and local operations in our Winter Service Guide, but here are some of the most-common questions PennDOT gets about how we handle winter maintenance. WHY ISN'T MY ROAD PLOWED YET? First, check that your road is a state-maintained roadway. Many local roads are actually maintained by your municipality, which means they will be in charge of plowing. It's notable, though, that we do have more than 700 agreements with municipalities to clear state roads in their jurisdiction. During a storm, PennDOT will plow and salt major highways first before moving to the less-traveled rural roads. During severe winter storms, equipment is often redirected from assigned rural routes to assist with plowing heavily traveled roads first. Keep in mind, while snow is falling, roads will not be bare. Plow trucks have very specific routes they cover, and they often take two hours or more to complete an entire route and get back to the starting point. That means, if snow is falling at 1 inch per hour, and a truck takes three hours to get back to the beginning of its route, 3 inches of snow will have fallen since it was last plowed. HOW CAN I TELL IF MY ROAD HAS BEEN PLOWED? Check winter conditions, including when your road was last plowed, on roadways across Pennsylvania by visiting www.511pa.com. Snow plow activity is color-coded based on how recently the road was plowed. Two-lane roads are blue; one-lane roads are purple. The darker the color, the more recently it was plowed. You can also click on an individual plow to view its historical route. THERE'S SNOW AND ICE IN THE FORECAST, WHY AREN'T YOU SALTING THE ROADS? PENNDOT'S SNOW PLOWS ARE ALWAYS PUSHING SNOW BACK INTO MY DRIVEWAY. STOP IT! Maintaining safe and passable roads is PennDOT's top priority when dealing with winter weather. To help meet that need, PennDOT urges residents to not shovel snow onto state roads that have already been plowed. Snow should not be shoveled onto any roadway as this can increase the potential for crashes, and property owners can be held liable for any resulting crashes. Snow should be shoveled or plowed to the right side of the driveway as you are facing the intersecting roadway. By piling the snow away from the oncoming direction of the snow plows, the snow will not be pushed back onto the driveway. Eliminate snow piles at the property entrance whenever possible. High accumulations of snow can obstruct the vision of motorists, posing a safety hazard. Do not push snow onto roadways at any time. This creates a hazardous condition for all vehicles. A PENNDOT PLOW DESTROYED MY MAILBOX. ARE YOU GOING TO PAY TO REPLACE IT? PennDOT allows property owners to place mailboxes within the limits of the legal right-of-way out of respect for the U.S. Postal Service's need to deliver, and mail customers' convenience of delivery. But because those boxes are within the right-of-way, damages are the responsibility of the property owner. If you've had issues with damages in the past, PennDOT recommends you consider installing a cantilevered mailbox support (PDF) that will swing a mailbox out of harm's way. You may also report the damages to your appropriate district through our Customer Care Center. Allow six car lengths behind an operating snow plow. Stay alert as slow-moving snow plows can be obscured by blowing snow. Never travel next to a plow truck, and never try to pass several trucks plowing side by side in a "plow train." Safely move as far away from the centerline when approaching a snow plow head on. 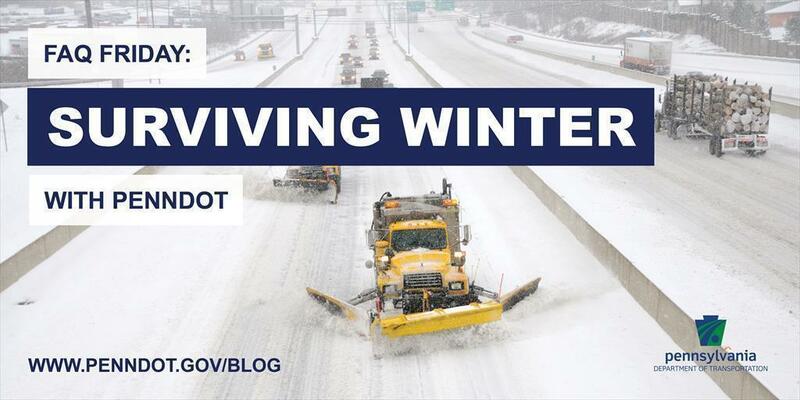 For more information on PennDOT's winter operations, winter driving safety tips, and ways you can prepare for winter weather, visit www.penndot.gov/winter.